Cheryl B. Schrader, left, and Susan Edwards, Wright State University’s first female president and provost, share their thoughts on being women leaders in higher education and their hopes for Wright State’s future. On July 1, 2017, history was made at Wright State University when Cheryl B. Schrader became the university’s first female president. Fast forward 12 months later and Wright State broke barriers once again by welcoming Susan Edwards as its first female provost. In the world of higher education — where relatively few women advance to top academic leadership positions such as dean, provost, president, or chancellor — Wright State is ahead of the curve. According to the 2017 American College President Study conducted by the American Council on Education, women comprised only 30 percent of college presidents across the country based on numbers reported for 2016. Women of color make up a far lower portion of college presidents, a mere five percent. These numbers are even smaller among national research universities, a select group that includes Wright State. Blazing trails is nothing new for Schrader and Edwards. They’ve been making their marks in uncharted territories for most of their lives. Growing up, Schrader thought she had only two career options — teaching or nursing. “I thought I was going to be really bold and become a math teacher,” she recalled. When she was in high school, her father asked her if she had ever considered becoming an engineer. At the time, Schrader had little knowledge about what engineers did and she had never seen a woman in the profession. Nevertheless, she followed her father’s advice and entered the electrical engineering program and the honors college at Valparaiso University. “That one comment from my dad changed my life,” she said. When she arrived at Valparaiso, she was one of only a small group of women studying engineering. She joined a sorority so she would have more opportunities to bond with other women and create friendships. There were also no engineering professors who were women. Since Schrader had never even seen a woman engineering professor, that career concept was about the farthest thing from her mind. The influences of her father and college professor also reinforced to Schrader the importance of having role models and mentors. It’s a lesson that has stayed with her throughout her life. In 2005, she received the Presidential Award for Excellence in Science, Mathematics, and Engineering Mentoring from former President George W. Bush for her accomplishments in encouraging and supporting underrepresented groups in engineering. Like Schrader, Edwards also grew up with a strong father. A first-generation college student, Edwards originally wanted to be a lawyer. After working in a forensics lab for a summer, her professional goals quickly changed. As Schrader and Edwards rose through the ranks in their respective areas of electrical engineering and biology education and research, they began to take on more leadership roles in higher education. Schrader held numerous academic positions at The University of Texas at San Antonio, including associate dean for graduate studies and research for the College of Engineering and the College of Sciences, university graduate recruitment coordinator, and associate research center director. At Boise State University, she served as associate vice president for strategic research initiatives and dean of the College of Engineering. Prior to joining Wright State, Schrader was the first female chancellor in almost 150 years at Missouri University of Science and Technology in Rolla, Missouri, from 2012 to 2017. Schrader also held many leadership positions in technical and professional organizations. This included her presidency of the Institute of Electrical and Electronics Engineers (IEEE) Control Systems Society, a global organization of over 10,000 members worldwide. She was the second woman in 50 years to serve in this capacity. President Cheryl B. Schrader, far right, and Provost Susan Edwards, second from right, at the Women in STEMM Symposium in November 2018 with, from left, Tracy Butler, from the University of Dayton, and Megan Rua, and Brenda Roman from Wright State University. Edwards began her career in higher education as a faculty member in the Department of Physiology and Pharmacology at James Cook University in Australia. In 2007, she left her native Australia to join the Department of Biology at Appalachian State University in Boone, North Carolina. She eventually took on a leadership role as assistant chair for three years before being appointed chair of the Department of Biology in 2012. Prior to joining Wright State, she served as vice provost for faculty affairs at Appalachian State. As women leaders, Schrader and Edwards have long known there are biases they have to work around. Throughout their careers, Schrader and Edwards have encountered the many double standards all women — especially those in positions of power — have to face. Edwards, who describes herself as a straight shooter who pulls no punches, admits she has been treated differently because she is so passionate in her values and convictions. While a man with those same qualities would be viewed as a strong and confident leader, Edwards has been called bossy — or even worse — simply because she is a woman. “That’s the difference,” said Edwards, who has been known to call out her colleagues when such inequitable treatment occurs. Schrader recalled teaching two classes while she was in labor with her oldest child, Andrew. She was an assistant professor at the time, and it was before the Family and Medical Leave Act was established. Her husband, Jeff, was working three-and-a-half hours away and could only come home on the weekends. There she was — in a new city with a new job, a new baby, and no circle of friends or family for support. Since there was no daycare available outside of standard business hours, Schrader staggered her evening classes with an adjunct faculty member who also had a baby. They took turns watching the children while the other was teaching. When her department chair didn’t want to give her the class times she requested, she ended up asking him for the days she didn’t want so she would get the schedule she needed. When Schrader was up for early tenure and promotion, a professor mentioned to her how much time she had taken off when her son was born. She had missed one class. Schrader’s experience as a young working mother is something she would never want another parent to have to endure. Throughout her career, she has worked hard to advance so she could help others balance work and family. 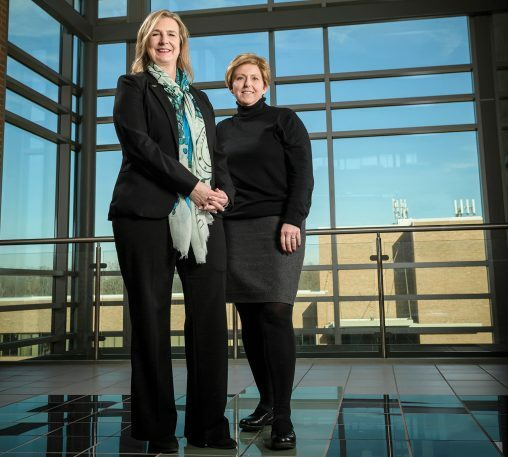 As Wright State’s first female leadership team, Schrader and Edwards recognize that they bring a unique perspective to the job. Not only are they the rare combination of a female president and a female provost, but they believe their backgrounds in the STEM (science, technology, engineering, and mathematics) disciplines help them to be more effective leaders. For Schrader and Edwards, their number one priority is people. They are especially mindful of the importance of mentoring and creating a network of support — not only for women but for all underrepresented populations. Schrader is especially proud of the university’s long history of serving people with disabilities. As provost, Edwards is committed to diversifying the student body and improving the quality of the educational experience for all students. She is pleased to see that the current applicant class is a much more diverse group of students than Wright State has seen before. 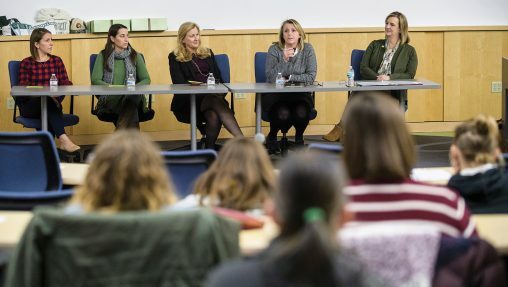 While Schrader and Edwards prefer to take a more holistic view of the campus community, they understand that — whether they want to be or not — they are viewed as role models by Wright State women aspiring to advance their careers. Years ago, Edwards made it her mission to support, nurture, and promote women and minorities in science. “As a first-generation student, I have been very fortunate to have a great many mentors who assisted me to see opportunities that I never knew existed. I want everyone to have the same opportunities that I had,” said Edwards. As they remain committed to paving the way for Wright State’s women and minorities, Schrader and Edwards acknowledge that in lifting one another up, everyone ends up benefiting in the end.